A bit grim but what is love but a grim wage of life and death? Sometimes, you win. And sometimes, you’re staring up into the face of skeleton, one that’s holding your broken heart. It might be time to switch pantheons. Whatever divine entity you aggravated with your romantic neglect has certainly abandoned you. Maybe you should go Polynesian? Why not? First off, there’s less clothing involved. Second, the music is incredible (ps. LISTEN TO KAVA KON.) Third, the drinks. Even if you’re drinking non-alcoholic items, tiki drinks glow, smoke and taste great. 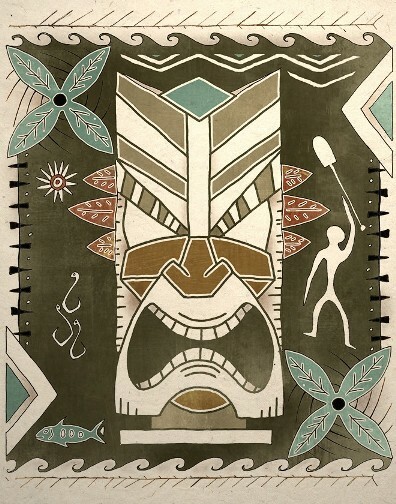 This Tiki God Art Print is a good start to getting in the good graces of something greater than you. 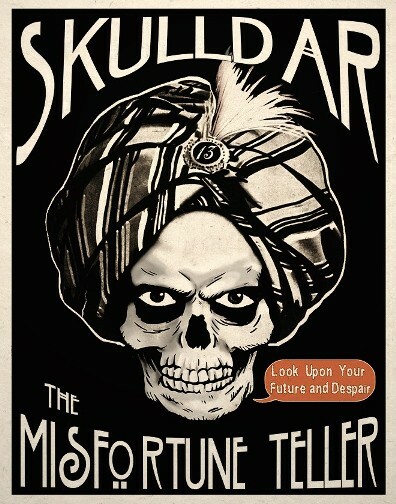 We’re not one to say “we told you so” and with this print of Skulldar The Misfortune Teller, we won’t have to. Look back upon your misfortune with the added pain of knowing that there WAS a way to avoid all this. You could have made it easier on yourself but you decided to go your own way. Had you consulted Skulldar, you would have at least known what troubles were in store for you so you could have adequately prepared for the moment when the tragedy struck and turned your life to slop. *Not going for the low hanging fruit there. Let’s face it. Women. Vampires. There’s only one other real threat to you. Robots. 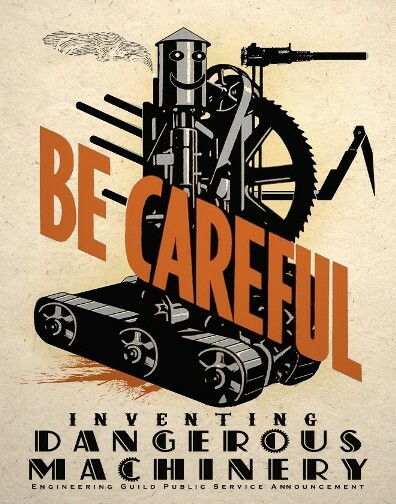 Machines are wonderful items of mechanical whimsy but they’re also potential metallic death merchants. Be prepared. With you alienating your allies and loved ones through neglect, you’re going to be more susceptible to taking comfort in machines instead of real people. This will lead to your downfall, as they will manipulate your trust to ensure their dominance over your weakened mental and poorly frail flesh state. Beware. BEWARE. Ultimately, we all die. We can’t avoid that. It’s a scary concept, that one day your consciousness will no longer be what it currently is. Whether you become a ghost or simply shut down, it remains the greatest mystery. 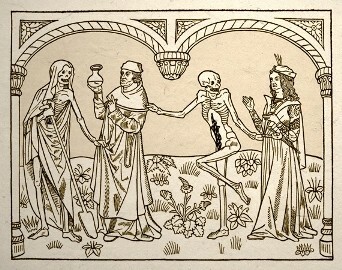 This Dance Macabre print might lessen the fear, or heighten it. It might also remind you to focus on those connections you have, be they romantic or fraternal. 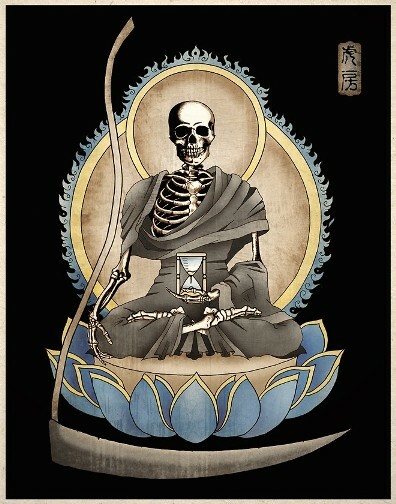 Life ends, and whether it is fast and joyous or slow and arduous – life is a finite entity. You only get one so make use of it as much as possible. If you screw up, don’t abandon your life Instead, redecorate it. Rejuvinate. Celebrate the passing of the old and welcome the new. And buy these prints from Tiger House Art. They’re fantastic. You can find the store here. And find yourself back here next week for another Tuesday uEtsy.